Thuraya is proud of its flagship products and services. Designed and built to the highest standard, our Land Voice and Land Data devices and services have achieved global recognition and success. Our vision of wanting everyone in the world to be connected at all times continues, and here at Thuraya we are growing our business to make that happen. A pioneer of many firsts in the Mobile Satellite Services industry, Thuraya has created some of the world’s most innovative, durable, smallest, smartest and most secure mobile communications devices. Thuraya products are used by people who depend on them when it matters most. The Thuraya XT - the world’s toughest satellite phone is dual certified for toughness with IP55 Ingress Protection Rating with full walk-and-talk capability, high penetration alert and the fastest data speeds on any satellite phone - GmPRS of up to 60kbps. It is the only satellite phone with GPS waypoint finder, a glare resistant color screen with brightness sensor. The 2012 launch of Thuraya XT-DUAL, a dual-mode satellite and GSM phone that operates efficiently both within the reach of any GSM network and when connected to the Thuraya satellite network - provides the highest flexibility to shift between available networks wherever you are. Our innovative and reliable land data products meet the demands of our end customers. 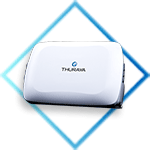 Thuraya IP proved to be a favored companion of global media organizations, government entities and NGOs, as well as energy and maritime companies requiring a reliable, portable, secure and easy-to-use satellite broadband terminal. Thuraya IP, the world’s smallest, fastest mobile satellite terminal in its class, delivered broadband internet speeds of up to 444 kbps. Then there’s the Public Calling Office (PCO), using prepaid or postpaid credit, the PCO was typically used as a village phone: Thuraya PCO-2110 makes voice, fax, data and SMS services available in a user-friendly public telephone service station making it the ideal choice for NGOs and Relief organizations.